Die Hard is a visceral movie which really causes its audience to feel. Not necessarily on a traditionally emotive level, but certainly we squirm and cringe as John McClane is brutalised in the most inhumane fashion over the course of two and a quarter hours. Whilst its impossible to know what being shot by a laser beam feels like, we all understand how it feels to bang our heads and stand on something sharp. So, as we see McClane's bare feet torn to shred by glass shards and heads bounced off of blunt objects, we grimace and flinch and react on a guttural level. This is empathy through pain; a perfect example of how to build audience connections in action movies (something rare in the age of CGI, rapid cuts and explosions-for-explosions sake blockbusters). Die Hard is a rare movie which can show violence at its most graphic, disturbing and realistic yet also induce waves of laughter from its audience too - John McTiernan's film truly is a Christmas miracle. 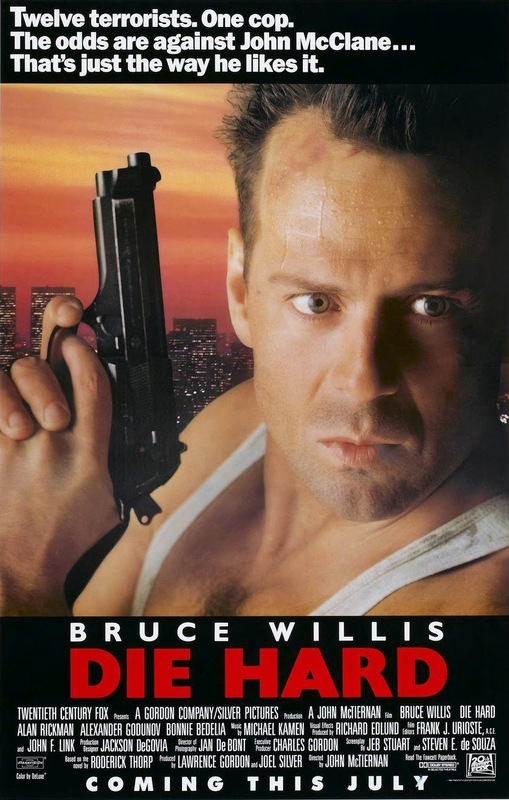 Bruce Willis, in his most iconic role to date, portrays McClane as a leering alpha male who charms us with his wit - whilst he navigates a plethora of incredibly dangerous scenarios we begin to understand that the only thing quicker than his brain and his physical dexterity is his mouth. McClane's situation is a peculiar one - a trip to meet his estranged wife on the night before Christmas finds the off duty police officer trapped in the Nakatomi Plaza as a host of terrorists take over the building and hold hostage several employees of the corporation. As the police and FBI continually bungle their negotiations, McClane finds himself caught up in a game of cat and mouse with a dozen terrorists as he attempts to secure his own freedom and that of the innocent victims caught in the web. But, as smart as McClane undoubtedly is, has he met his match in the form of sociopathic terrorist leader Hans Gruber (Alan Rickman)? From a simple set-up - terrorists chase a hero around a large building, both sides try and annihilate the other - Die Hard blooms into a perfectly structured, unbearably tense piece of art which represents the pinnacle of 1980s Hollywood action cinema. One perfectly staged set piece follows another - how can McClane escape the air vent? How does he survive Gruber pointing a gun straight at him? We marvel as we watch McTiernan reveal the answers to us in a profoundly episodic fashion and feel euphoric when the answers are presented to us. Willis' performance is undoubtedly one of the most physically taxing imaginable, but it is the combination of brain and brawn which truly gets the audience on his side. Beautifully shot, featuring lush and crisp cinematography from Jan De Bont, Die Hard is also peerlessly inventive on a technical level too. Michael Kamen's ominous score combines classic Hollywood studio techniques with modern tropes too - Ode to Joy recurs as an orchestral leitmotif and often finds itself perversely mutated with a bravura minor key rendition of Winter Wonderland; the result is as unsettling as it is astonishingly original. The soundtrack permeates dread and accompanies the stunning visuals with incredible synchronicity and helps transcend the movie from simply a blockbuster into a classic example of cinema. Late in the film, a slow motion fall from a roof-top takes on an grandiose, operatic level of opulence and it is clear to see that this film is not simply about explosions, wise-cracks or "might makes right" bravado. True, we have seen each of these things but what we have also witnessed is absolute "pure" cinema - the unique powers of the medium have been utilised to create a perfect example cinema at its finest. Its a movie as spectacle, and a film which makes us think and, equally, feel. McTiernan has captured the very essence of cinema and, it is fair to say, Bruce Willis has given him the ultimate leading man. Yippee Kay-aye indeed.